Parent and Player Concussion Education & Training - REQUIRED! Welcome parents, guardians, and players to our Concussion Education and Training page for families. Be sure to watch the adult video and have your child watch the age-appropriate video before starting the season. This is a yearly requirement, but feel free to come back frequently to remind yourself and your child about the signs and symptoms of concussions, and the necessary steps to take to ensure a smooth recovery and safe return to play! To help ensure the health and safety of young athletes, CDC developed the Heads Up: Concussion in Youth Sports initiative to offer information about concussions to coaches, parents, and athletes involved in youth sports. 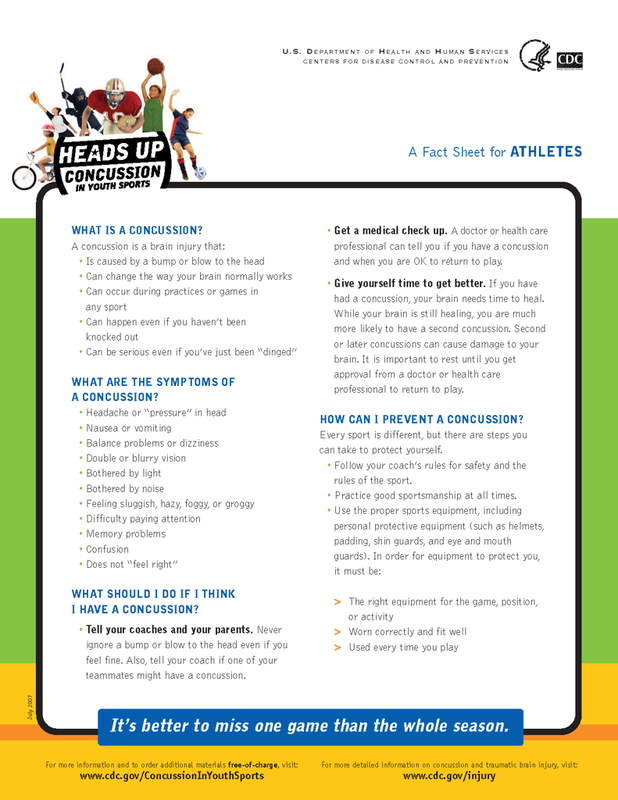 The Heads Up initiative provides important information on preventing, recognizing, and responding to a concussion.